Last Sunday was the first day of Advent which marked the beginning of the Liturgical Year for Western Christian churches. Advent Sunday is always the fourth Sunday before Christmas Day, which is the day when Christians remember and celebrate the birth of Jesus. The precise date of His birth is not known, but it was roughly 2015 years ago. In addition to remembering the birth of Jesus, Advent is also a time for looking forward to His promised second coming, not for the salvation of those who would believe in Him, as at His first coming, but for their resurrection. When He comes again, believers will be raised from the dead, and they will be transformed to have spiritual bodies similar to His. Living believers will also be transformed without experiencing death. His second advent is known as the Parousia. Jesus proclaimed that He ‘is’ the Light of the World. He did not say He ‘was’ the Light of the World. (See Text for the Day at yesterday’s blog.) Within that context I have heard that pagans on their conversion to Christianity would decorate trees with lighted candles to symbolically represent their conversion from darkness to light. 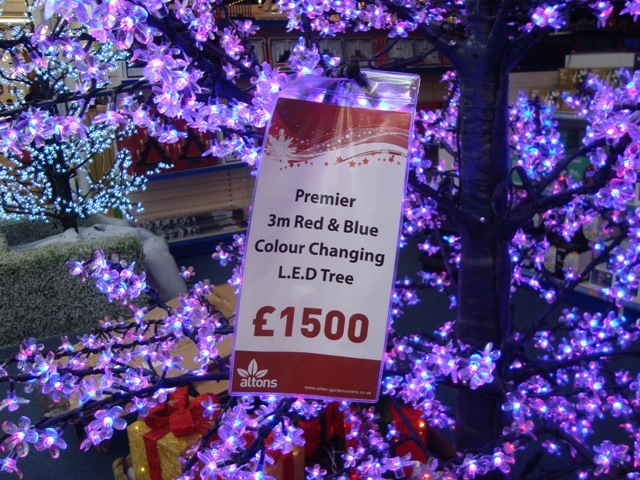 At this festive time of year, illuminated Christmas trees are often the central feature of household decorations. 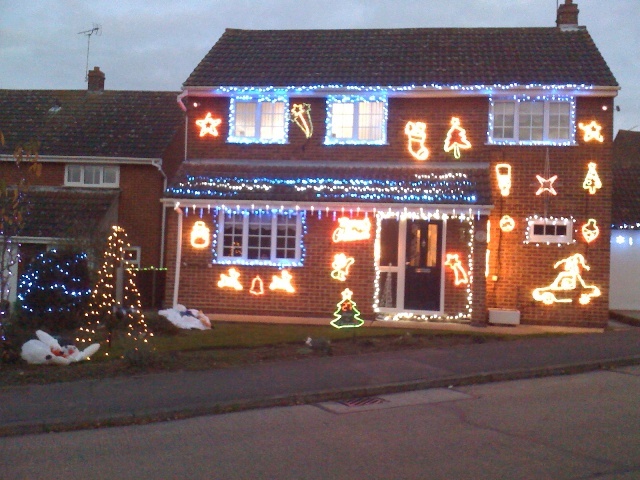 More recently people have been decorating the exterior of their homes, and where they have trees, they have been festooning them with colourful lights. 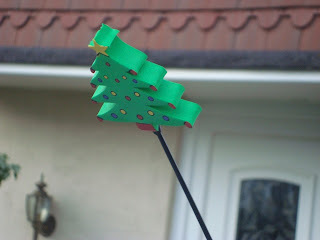 Where I live, there has been an increasing trend over the years for these decorations. They certainly brighten up the neighbourhood when the hours of darkness far outnumber the hours of daylight. As I take a stroll after my evening meal, I’m always cheered by the sight of these illuminations, not because of their subject matter: snowmen, stars, bells, Father Christmases and the like, but because I see beyond them to the Light of the World - He who brings hope and life to those who would believe and trust in Him. In early October I visited Alton Garden Centre, near Basildon, and as a result I was inspired to do a blog article about the experience. (Market Gardens/Garden Centre*) I was critical of some of the stuff sold there because of it being unfriendly to the environment, particularly petroleum and electric powered machinery used by gardeners today, unlike when I was a boy. Most gardening then was done with hand tools; now there are garden vacs, electric strimmers, mechanical saws and sit-on lawnmowers. I must confess that gardening is easier as a result, and that I use a small electric lawnmower. 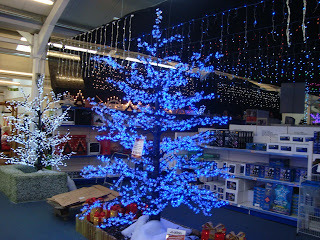 Well, to oblige my better half, I found myself at Alton Garden Centre again. The place hummed with activity. A large proportion of the Centre had been transformed into a Christmas bazaar where there were the most astonishing objects for sale, one of which was an artificial 3 metre-high Christmas tree, illuminated with LED lights that changed colour from cobalt to mauve, pink, purple, orange, red, purple, pink, mauve and back to cobalt, ad infinitum. This object had a price tag of £1,500! 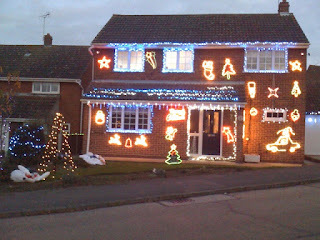 The only redeeming factor was the use of LED lights which consume very little electricity. 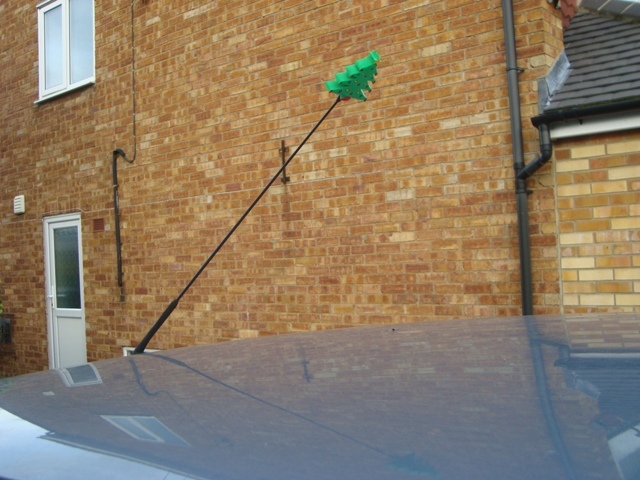 For far too long I have been meaning to remove the roof rack from the top of my car. I have always had excuses for not doing so. The latest one was that I might need to transport the dinghy that had belonged to my daughter to her house for storage or for destruction. 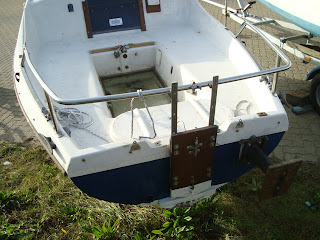 The dinghy was in a bad state of repair and leaked profusely. Well, I suppose I should have done something about removing the roof rack when the dinghy was sold to a new owner, along with ‘Ladybird’, the yacht I had owned before she acquired her. If I had removed the roof rack I would have saved on petrol, because the car would have been more efficient without having to expend energy overcoming friction caused by the movement of the rack through the air. Later is better than never, but procrastination cannot be justified when good can be achieved by taking action earlier than later. I am to be blamed for my inertia, and I’ve paid the price. My lack of action has not helped reduce my carbon footprint. One advantage of having the roof rack on the car was that I could easily identify it in a car park. Some car parks are very large, as is the case at the Westfield Stratford City Shopping Centre, and there some sort of prominent marker is very helpful when it comes to finding the car. Now that I have removed the roof rack, I have added a temporary marker to the car’s aerial. This is in the form of a miniature polystyrene Christmas tree. I purposely searched for an aerial marker in a motor shop at Burnham-on-Crouch where I bought the only one of its type in stock. Since then I have discovered an online supplier* of ‘Aerial Balls’, and similar markers. If you are thinking of getting one, have a look in your local motor shop, because there you will not have to pay a delivery charge. A little spring attached to a sticker was also supplied with mine, for attaching the marker to a desktop. The marker could also be fitted to the top of a pencil, or so the makers claim, but I suspect the hole in the marker would not be large enough for inserting a pencil, unless it was trimmed beforehand. The Aerial Balls* website has a link to ‘Free the Children’ website that I have included below. Yesterday I considered the Hunter 490, designed by Oliver Lee. 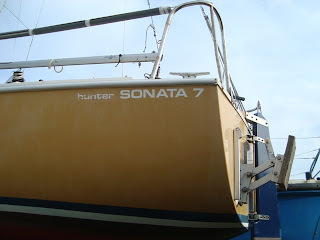 Today, I’m looking at the Hunter Sonata, designed by David Thomas. Commissioned by Peter Poland of Hunter Boats in 1975, Thomas set about designing the round bilge Sonata based upon his highly successful multi-chine quarter-tonner, the Quarto. He came up with a smaller and cheaper 22 footer with a cracking performance. Credit must be given to Hunter Boats who did a very good job moulding the hulls and decks for completion at their factory, and for home completion with a standard set of kit parts. There was a choice of hulls: those fitted with a deep fin keel and those with a drop keel. Many clubs chose the class for one-design racing due to their popularity and excellent handling characteristics. In recognition of their fine qualities and sheer numbers, the RYA drew up strict regulations for one-design racing and gave the class National Status. The RYA adopted them as their first official racer/cruiser. On all accounts they couldn’t have chosen a better, affordable yacht worthy of the honour. No doubt they considered others such as the ‘E’ Boat, and the Anderson 22, but they were nowhere near as popular or numerous. 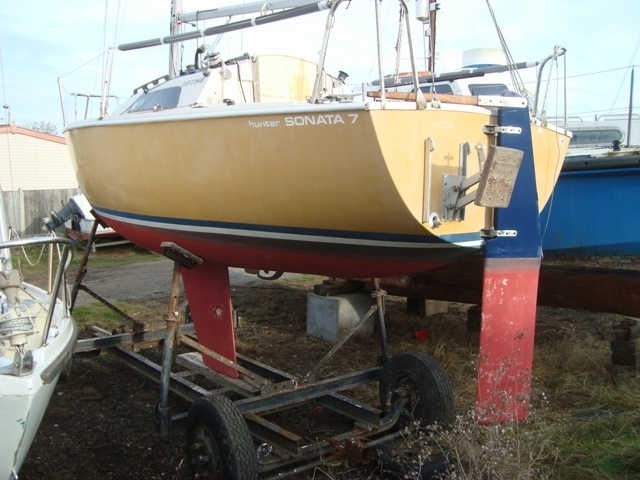 In 1977 I bought a kit Hunter Europa from Hunter Boats of Rochford, and fitted her out for cruising and club racing. 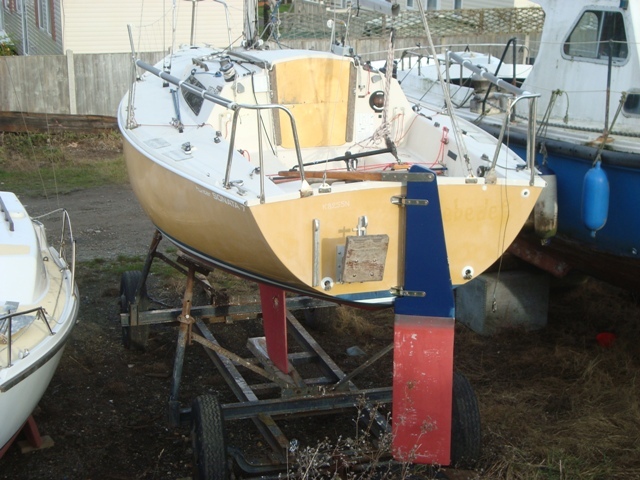 * (See Small ‘Zeta’ – Hunter Europa 19 in the Links section) At that time Hunter Boats ceased producing their Hunter 490 which was a brilliant small cruiser/racer. She had a proper drop keel, but the internal housing for it somewhat restricted the accommodation. Although she had little more than sitting headroom, she was a very good boat for single-handing. Stowage space wasn’t up to much, but there was enough for solo weekending. She was a trailer sailer that could be left on a mooring if need be, without fear of her capsizing. Her high aspect Bermudan mainsail and Genoa gave her a good turn of speed. All lines for working the boat were led back to her spacious cockpit. She was vice-free and she had a well-balanced, sensitive helm. Her performance to windward was above average, partly due to the tight sheeting angle of her foresails. This was achieved by mounting the shrouds on chainplates attached to the sides of her cabin trunk. Racing crews could sit her out, if somewhat painfully, by perching on her raised coamings, but not if a pushpit was fitted. Peter Poland, the man in charge of Hunter Boats at the time, decided to move on and produce the Hunter 19 followed by the Europa 19, all designed by the legendary Oliver Lee. I felt it was a shame Hunters stopped making 490s, but in terms of good business, they were proven right. I will add a footnote that bigger is not necessarily better. The problem is commercial viability. For a couple who are in love, enforced separation can be a grievous experience. They may yearn for physical contact and the sharing of mutual love by which their bond and commitment to one another can flourish. René Julien’s bronze sculpture, ‘The Return’, captures the moment when two lovers are reunited. Whatever their status, partners or man and wife - certainly not mere acquaintances - they are overjoyed at their reunion; particularly the female who flings herself at the one she loves. He carries a portfolio under his left arm, but holds her steadily with his right arm and extended hand. Ecstatically she lifts her feet into the air. The two are sealed together in an embrace. Her hands express her joy as he tilts back his head in anticipation of the sweet touch of her lips. At the man’s feet there are two doves engaged in an act of union, oblivious to what is happening above and of the imminent danger that threatens them. 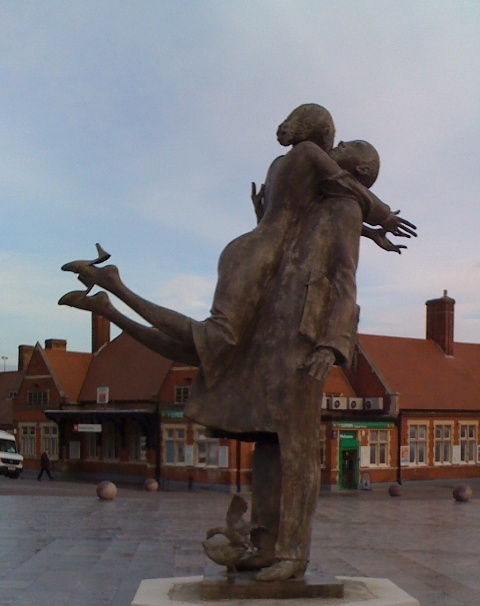 This £50,000 sculpture by the Belgian artist was funded by the Government’s Homes and Communities Agency as part of a project to revamp Victoria Gateway Square adjacent to Southend-on-Sea’s Victoria Station. 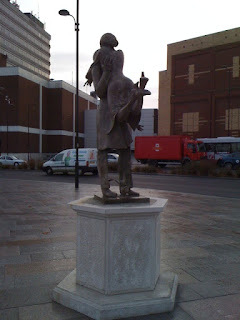 Councillors chose it from a range of sculptures because it best represented what the location was all about – a venue where people meet when returning home to Southend. I like the sculpture, not so much for its artistic merit, but for the symbolic portrayal of unified and precious love between a man and woman. The enigmatic doves add to its charm, and they remind me of the fragility of life. As good as his word, Mr Anonymous sent me two more photos of his Sharpy. They provide extra information regarding the nature of the floats which I believe were designed by him. They are made of plywood joined at the chines by GRP tape. Altogether, along with the support beam they weigh between 15 and 20 lbs, which is considerably lighter than the 80 lbs keel. 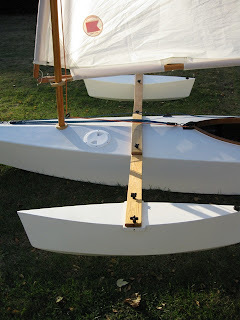 The boat will be sailed with a plywood centreboard instead of a keel. I am hoping all will go well and that the new configuration will be a great success. Spread apart your thumbs and index fingers; then join your index fingers to your thumbs. By so doing you make a rectangular frame through which you can look. This is the equivalent of a viewfinder on a camera. Close one eye and select views as if you were looking through a proper viewfinder. You can move your hands away from your eye to reduce the field of vision or move them towards your eye to increase what is included in the picture. When we take photos with a camera we select the field of vision by adjusting the focus or by moving closer to or further from the subject. We usually do this without giving too much thought to the process; it’s like a subconscious action or an automatic reflex. Artists sometimes select their subjects by first looking at them through a small picture frame similar in proportion to the canvas or paper on which they will paint or draw their picture. The frame is a great help to them because the positions of objects, shapes and forms within the field of vision can be transferred to the canvas or paper. I have used this method when painting landscapes, still-life subjects and portraits. When I am taking photos I am conscious of the positions of objects within the viewfinder. One thing I try to avoid is taking a photo of a person who is sitting or standing in front of an upright object such as a road sign or similar vertical object, because when the photo is developed one sees the object apparently growing out of the person’s head! It’s a bit like those irritating photos where the person being photographed is unaware that someone behind them is holding two fingers in such a way as to give the impression they protude from the person's head. The idea is to take-the-mickey out of the person being photographed by giving them bunny ears or cow horns. Anyway, when I’m out and about with my camera and I come across something interesting, I’ll look at it through the viewfinder, make a selection and push the button. 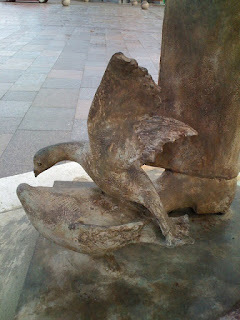 Today, I’ve posted four photos of selections that interested me. I like them because they record natural patterns, textures and forms, all found beside the water. 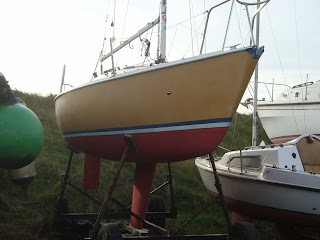 Regular visitors to these pages will know that I built a Sharpy roof rack keelboat designed by Derek Munnion. While building her I documented the build with descriptions and photographs. All of these articles are available in the blog archives, and they may be accessed by using the search facility at the very bottom of this page. Simply type in the words, ‘building sharpy’, and links to the articles will appear in a popup at the top of the page. Within my descriptions of the building process I included photographs sent to me by a builder of a Sharpy in the USA. He has the pseudonym of ‘Mr Anonymous’, because he would prefer to remain anonymous. He started building Sharpy number 2 well before me, and he was a great help when I was building mine. 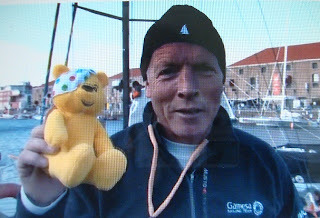 The good news is that Mr Anonymous’s Sharpy has been test-sailed, and he is extremely pleased with how she handled. I was not surprised, because my Sharpy performs very well. In fact, she is the best performer of any of the boats I have built. Well, I was chuffed to receive a recent photo of Mr Anonymous’s Sharpy which has the added facility of two floats, one either side of the hull. These have not yet been tested, but they will provide an option instead of using her ballast keel. 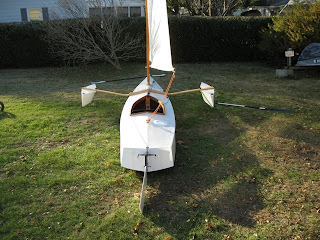 The test sail was carried out with the standard 80 lbs drop-keel. 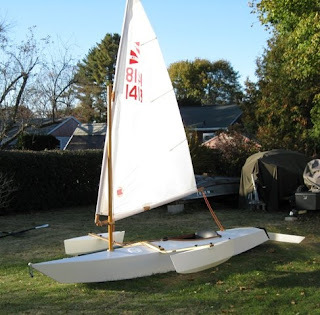 The float configuration will require a normal centreboard, because there will be little advantage in sailing her with a ballast keel when she is rigged with the floats. I shall be very interested to learn how Sharpy number 2 sails when she is rigged with floats. If the boat sails well, there could be an advantage for when launching and retrieving the boat off a beach. 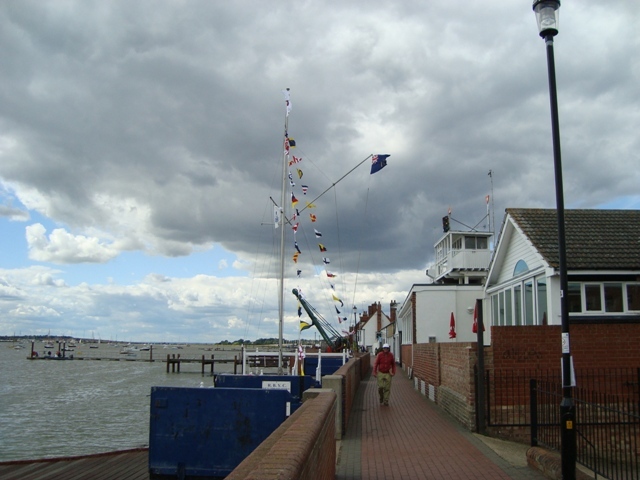 A disadvantage of the floats is that they restrict access when coming alongside a pontoon or jetty, but if both systems are available, one could choose which to use according to where the boat will be sailed. 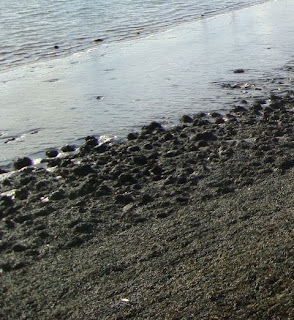 On open water and when launching off a beach, the float setup may be better. Yesterday, we saw our grandchildren being rewarded for their patience; they had waited twenty minutes or so in a queue to see Father Christmas. He gave them each a book and asked what presents they would like on Christmas Day. That morning they had visited a toy shop where there were miniature radio controlled cars, and within seconds they mastered the controls. They had the cars zooming backwards and forwards, gleefully and deliberately crashing them together. Fortunately the cars were designed to withstand head to head impacts. It was no wonder that their request to Father Christmas was for each of them to have a car, but wisely he made no guarantee that he would be able to satisfy their desires. That was not the end of excitement for the children that day, because after Santa’s grotto they were soon on their way to a birthday party, where there would be three sets of triplets and other friends. As is the vogue these days, the party had been arranged to take place at an activities centre. The theme was trampolining. We were ushered into a large gymnasium where there was a trampoline and a bouncy castle. An instructor supervised children on the trampoline, while others played on the bouncy castle or ran around the gymnasium kicking footballs. 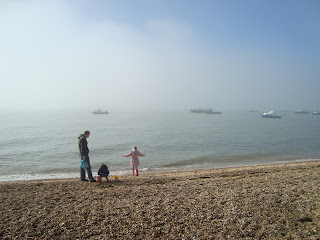 As you can imagine, it was rather noisy, and there was an awful lot of activity, but the children loved it. No one was hurt, and after expending enormous amounts of energy the youngsters were taken to an upper room where a table was prepared for a party feast. The iced birthday cake was shaped to represent a red sports saloon, and it was decorated accordingly. The main meal consisted of sausages and chips - a very popular menu! Ice creams, cakes and jellies followed. Adults consumed what the children did not devour. I was required to demolish two ice creams - the second was not eaten quite as enthusiastically as the first, but they could not be wasted, could they? At the end of the party the children were all given goody bags, which occupied them on their way home in the car. Back at home they continued searching the contents of their bags. Each bag contained a puzzle with movable squares that formed a picture of an animal’s head. 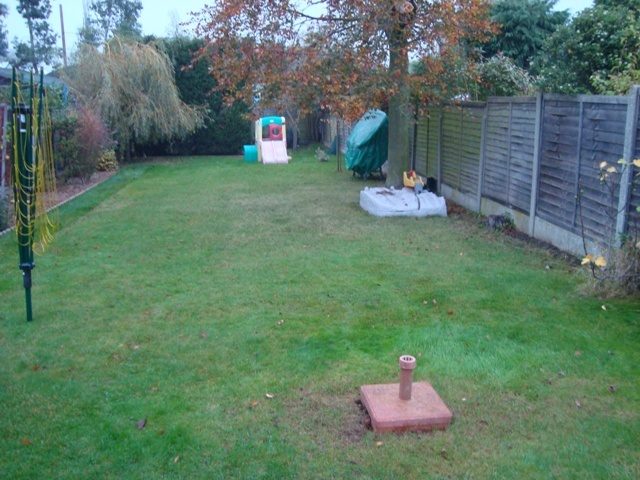 One of the boys moved the squares around; afterwards he could not return them to their original places. This was highly frustrating for him - more so when I could not instantly put the matter to right. He was amazed at my incompetence. After a bath, more play and the reading of a story, the children were not long in bed when they fell asleep. It had been a right good day. I’m one of those fortunate grandparents with several grandchildren, seven in fact. Yesterday my wife and I had the whole day with our youngest three grandsons. Born together on the same day by the same mother, means they are triplets, a word that they understand. They have learned that there are not always three identical toys, one for each of them with which to play. They are learning what sharing really means and it’s not easy. Parents and both sets of grandparents try to treat them fairly without favouritism. We are learning that each child has his own character, strengths and weaknesses. We have an innate desire to teach them the difference between right and wrong and that it is noble to do those things that are right; in fact, that there is only one true way and that’s to be on the side of right and to shun all that is wrong. We try to teach them these things, but they instinctively know when they are doing wrong and when they are doing right, so I suppose it’s our job to reinforce what they know and to support them in doing what is right. This business of morals is something that concerns us all in our life, unless we have no conscience whatsoever. Apparently psychopaths can carry out the most outrageous crimes to fellow human beings without batting an eyelid and sleep well at night; they wake up in the morning and do not give their heinous acts of the previous day a single thought, or if they do, they deny ever doing them! Well, yesterday, my wife and I took the children to Southend-on-Sea where there was a hive of activity in the High Street, all purporting to relate to Christmas – a celebration of Christmas. In fact, nothing was mentioned about Jesus, the Babe who was born in a stable for the redemption of those who would seek Him. There were no billboards announcing the good news; there were no invitations for people to join together in celebrating His birth; instead there was a large open-air market, and shops were advertising discounts on their merchandise to encourage people to part with their money. 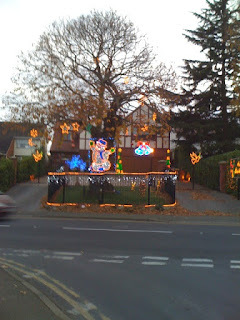 Father Christmas would be arriving in his sleigh and the town’s festive lights would be turned on. Father Christmas would be in the mall, and if you liked to pay £3 per child, he would give them each a present. We had already treated our grandchildren at an activity stall where they could make themselves a wizard’s hat or a sparkly wand, but their day would not be complete without seeing the white-bearded man dressed in a red gown. After an interminable wait in a very long queue their time came to meet the legendary, ubiquitous magician who can travel faster than the speed of light to deliver toys to all good children on Christmas Eve. He turned out to be very fair - a man with high morals. Each child received a colourful book worth more than £3! The price tag on each book was £3.75. What could be fairer than that? In another seven days Sven Yrvind should arrive at Fort-de-France on the island of Martinique. 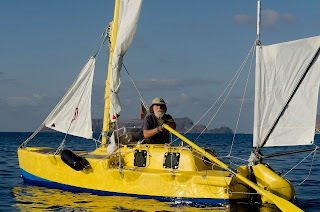 After leaving Porto Santo, Madeira, he will have been at sea for approximately 45 days, averaging 2.7 knots. What can he expect to find when he arrives at this French administered Caribbean island? To report to customs he will most likely enter the Baie de Fort de France and make his way to the main port for clearing customs. Experienced sailor as he is, he’ll be keeping a good lookout for any coral reefs while skirting the southern shore of Martinique. As I write, the average wind there is about 4 kilometres-an-hour from the northeast, and in the Baie itself the wind could be almost non-existent, which means he should be able to get his boat in without any problems. 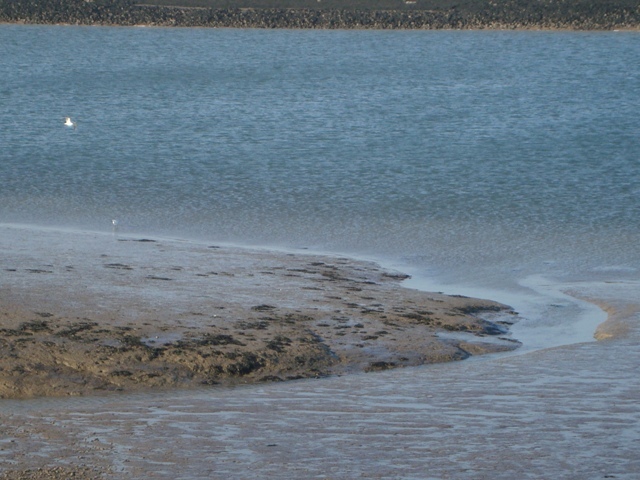 There are plenty of good anchorages, and the tidal range is small. 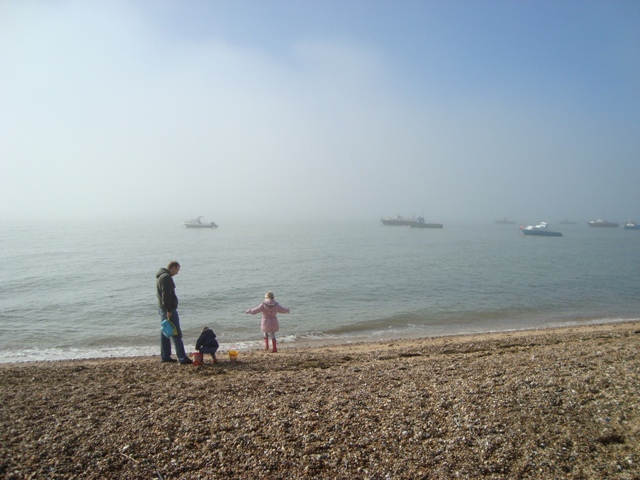 He may even be able to beach his boat and haul her up on the sand which would save a lot of hassle and give him rest. Fort-de-France will have everything he needs for victualling, and there will be plenty for him to see and do on the island. If I were there I would want to have a close-up view of Mount Pelee, a volcano that erupted in 1902 completely destroying the city of Saint Pierre. While visiting the northern region I would want to explore the rainforests. Public transport is by taxi or mini-bus. A journey to Saint Pierre by mini-bus would cost about 7 euros, which is quite expensive. Taxis are even more expensive. There may be bike hire, but the island is very mountainous, and I wouldn’t fancy cycling too far. Apparently, hitchhiking is popular, and I’m not surprised, considering the cost of travel. 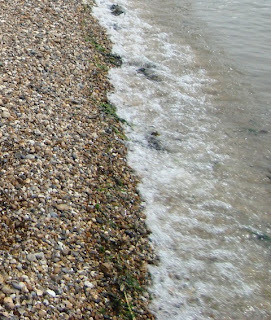 I’ve got an idea that Sven will look for simple things, like having a swim in the crystal clear seawater, or sitting on a bench where he can watch the comings and goings while drinking from a glass of ice-cold water. No doubt he will want to sample local cuisine. For sure he will want to visit the Bibliothèque Schoelcher, which is an old colonial building that is now the library. For fresh foods he will visit Le grand marché, a covered market in the rues Blénac and Isambert. He may be interested in looking at the Sacré-Coeur de Balata church which is a replica of the genuine article at Montmartre, Paris. If I were there I would make an effort to visit the Jardin de Balata, which is a botanical garden 10 kilometres from Port-de-France. I enjoy a good walk; therefore I would explore one or two of the marked trails maintained by the National Forest Service. A week or a fortnight at Martinique should be sufficient for doing these things. Well, I hope Sven is in good health when he arrives at the island, and that he will enjoy his time there. Photos are from my computer’s archive, and I have lost record of the original sources. I trust I shall cause no offence by publishing them here, but if I am asked by the person who originally published them to remove them from this article, I’ll certainly oblige. I invite you to join me on a virtual walk beside the River Crouch at Hullbridge, Essex, UK. It’s Wednesday, 9th November, 2011, and the time is about 1600. Having parked the car at the Hullbridge public car park we stroll past the Anchor public house towards the Ferry Road slipway. The sky is clear overhead; the air is damp and it’s a dead calm. 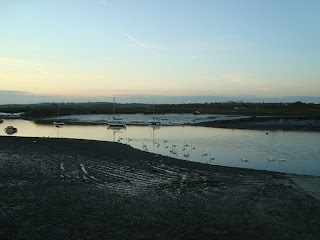 A flotilla of swans moves slowly upstream by the Up River Yacht Club’s slipway. Apart from these graceful creatures we have the place to ourselves. We turn east and pass through a narrow, leafy way with arching trees overhead. To our left between the foliage we have glimpses of a few yachts that remain on their moorings, and to our right, hidden behind a high privet hedge, there are the laid-up yachts of the Up River Yacht Club. 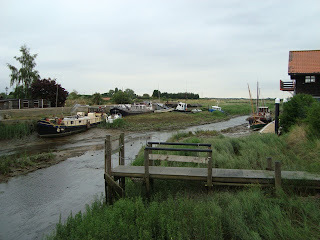 As we progress, views open, and we can see the expanse of the river towards Hullbridge Yacht Club. 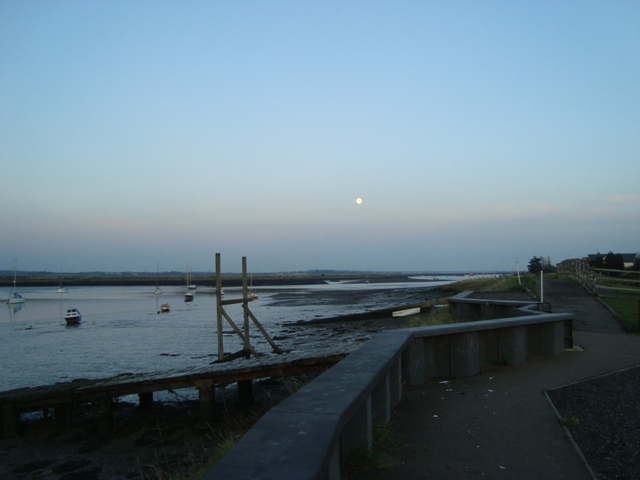 Across the water, we observe the buildings of Marsh Farm and a lone runner who jogs towards South Woodham Ferrers Yacht Club. 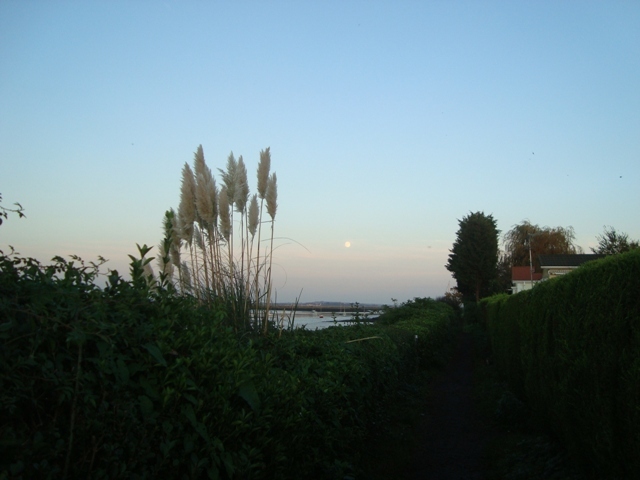 Progressing, we crunch our way along a gravel path that borders a large compound which is packed with caravan homes;* at the far end, before the Recreation Park, bramble bushes restrict our view. Light is fading and a full moon slowly lifts above the horizon. A couple of dog walkers have fun playing the age-old game of throwing a ball for their dog to retrieve. Their terrier wags his tail in anticipation, and even before the ball has been thrown, he scampers off in search of the missile. 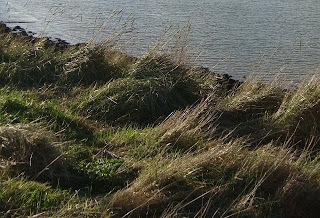 At the far end of the park, the path is covered with Asphalt, and a flood defence barrier runs beside it. Immediately joining the park we come across the Hullbridge Yacht Club where only a handful of yachts are laid-up. Years ago, the Club’s grounds would have been crammed with boats. I suspect the current owners may have a new agenda. 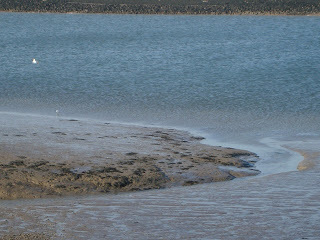 Much of the waterside beyond the club has been developed by the building of luxury homes, complete with pile moorings, and the club would be prime land for similar properties, if planning permission could be obtained. We continue our walk past a line of tall poplar trees, the rendezvous of millions of migratory starlings, but none are present because they have fled to warmer climes. These beautiful trees mark the boundary of a caravan homes park** which now has few residents. Could diminishing numbers point to the possibility of permanent homes being built? All things are subject to change, but not necessarily for the better. After a short distance, we find ourselves looking at the aforementioned luxury homes. Four of them have recently been built, each individually designed, but all with north-facing windows and balconies. One has a curved roof and a large circular window above an upper floor, glass-panelled see-through lounge. Another well-glazed property has unique ‘V’-shaped windows that protrude outwards to provide additional viewing for the occupants. Finally we arrive at Brandy Hole Yacht Club that has its own balcony overlooking the river. 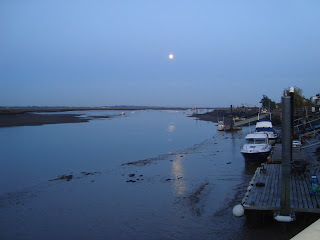 It’s here that we pause and observe a peaceful scene as the moon continues rising above the adjacent marshland. Soon it will be dark and we shall return the way we came, thankful for having shared time together. 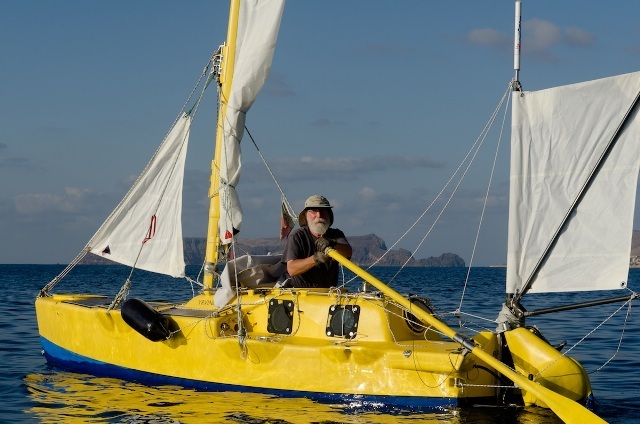 As I write, leading sailors competing in the Transat Jacques Vabre Race across the Atlantic from Le Havre in France, to Puerto Limon, Costa Rica are nearing the finish line. Four of the thirteen IMOCA Open 60 teams were forced to abandon the Race. I had pinned my hopes on the ‘Gamesa’ team consisting of Mike Golding and his co-skipper Bruno Dubois, to win the Race, but it transpires they have been handicapped by a stowaway, the piratical Pudsey Bear. Mischievous, as always, he has been a real distraction to the ‘Gamesa’ boys, to the extent that they are the last in their class. A week ago I created a work of art worthy of sponsorship by the Arts Council. I raked up leaves from my front and back gardens and placed them into piles. I then admired their colours, textures and forms. 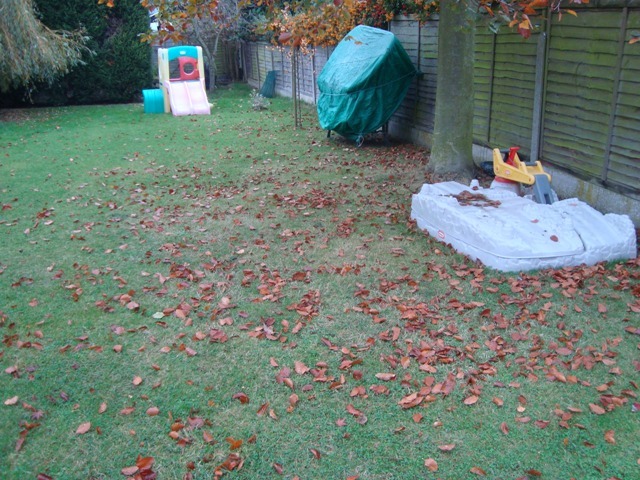 I also pondered the spatial relationships between them and mused as to their transitory nature – leaves that were once full of sap and vitality, but in the autumn of life, they were destined to decay. 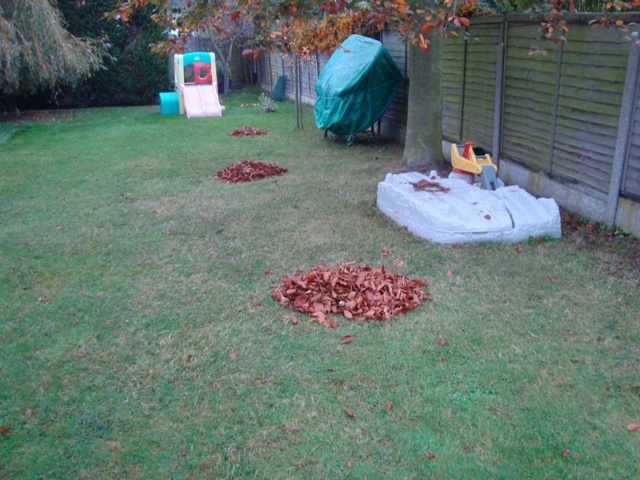 After those aesthetic, stimulating experiences I shovelled the leaves into my green waste dustbin and placed the bin on the pavement outside my house. Finally they were taken away by the local Council recycling team for composting and reconstituting into useful garden mulch. I surely deserve a grant from the Arts Council for future creative enterprise, especially if I can involve many people in creative imaginative experiences. Even if leaves had fallen at the beginning of the year and throughout the summer until autumn, I would have been reluctant to compete with the ‘Trust New Art, Chalk South Downs’ experiential art project, for fear of depriving the artists who executed so great a masterpiece from the satisfaction of receiving accolades from the Arts Council. I did not want to steal their thunder, nor did I wish to have funding in preference to them – selfless and altruistic, that’s me. But you never know – One day I could be recognised by the Arts Council as a brilliant, gifted, talented artist worthy of a reward, even for this superlative daily Blog. I’m mightily pleased that Laura Dekker has arrived in Durban after 47 days at sea, and having sailed approximately 6,000 nautical miles from Darwin. I’ve followed her post-dated log and sailed with her in my armchair every day and night through frustrating calms, contrary winds, turbulent seas and happy times when the sun has shone and the wind has been fair. 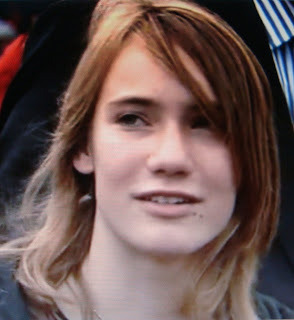 She’s a courageous young lady whom I much admire, just a fraction of my age, and yet she has accomplished so much. She knows what it is like to be in tune with the ocean, and to be happy with her lot. She appreciates the simplest of pleasures, the ever changing shapes of clouds, the wondrous movement and colour of the sea, breaking water and flat calm, twinkling stars, flying fish and even the smell and taste of freshly baked cookies! Laura post-dated her log to avoid giving clues to Indian Ocean pirates as to her whereabouts, and there was speculation regarding which route she would choose. Would she opt for battling against contrary winds of the Red Sea to pass through the Suez Canal into the Mediterranean, or would she sail west to Durban, before turning south for Cape Town, leaving Port Elizabeth and Cape Agulhas to starboard? Both routes have their difficulties, without the added anxiety of possible capture by pirates. After provisioning her boat I feel certain she will continue southwards for perhaps the most challenging leg of her around-the-world voyage so far. She will have to overcome strong contrary currents and mountainous seas, unless she is extraordinarily fortunate. The seas of Cape Agulhas can be particularly vicious, since there is the expanse of the Southern Atlantic between Cape Horn and the African continent for generating them and they rise over shallows, lifting upwards to the landmass. I congratulate Laura for her achievement and my prayers are for her as she continues with her marathon voyage. The majority of Pegasus 700 yachts were fitted with twin bilge keels and they were very good to windward. Some were deep fin keel yachts and a number had shallower wing keels. There were also lifting keel versions and centreplate versions. Their internal accommodation was user-friendly, apart from only having 5’ 10” of headroom by the companionway, and less elsewhere. They had settee berths either side of the cabin and a table off-set to starboard. At the companionway there was a fixed basin and a pull-out stove unit to starboard. There was a reasonable amount of stowage space under the berths and behind and above the back supports. In the forward cabin there was a ‘V’ berth and a chemical head. I suspect the port hand quarter berth was used for stowing gear, rather than for sleeping. The masthead version had a deck- stepped mast set fairly far back from the bow allowing for a large furling Genoa and a high aspect Bermudan mainsail with a very short boom. Immediate reefing could be achieved by furling the Genoa and the main was slab-reefed with all lines running to the cockpit. 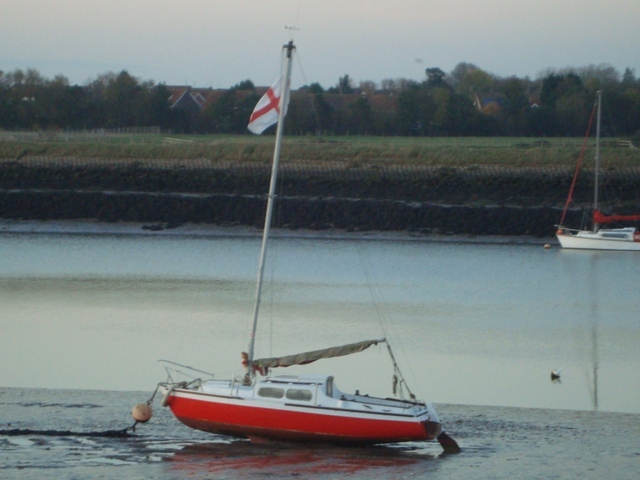 The fractional rigged version had her mast stepped further forward, and she had a mainsail with a longer boom. 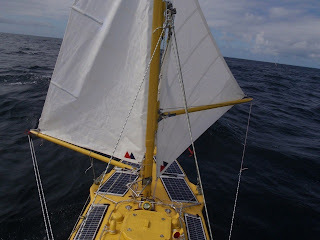 There was an optional Gunter-rigged version with the mast more forward and her mainsail had a long boom. Mechanical propulsion was by a 6 to 8 HP outboard motor in a well, but some were fitted with Volvo MB2A 7.5 HP petrol 2 cylinder inboard engines with out-drive prop units. 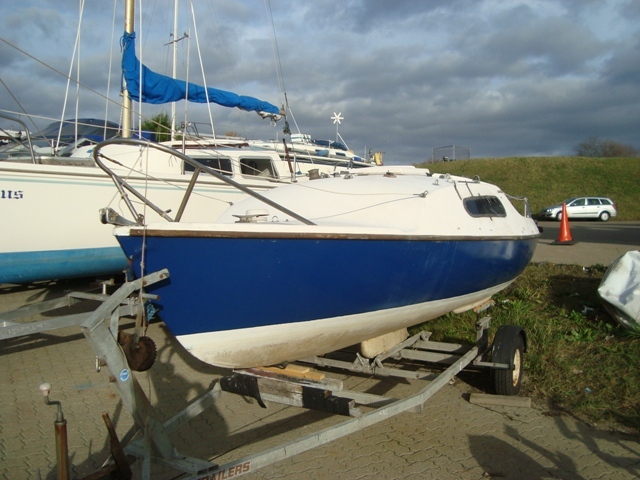 I have sailed a Pegasus twin keel yacht and I found her to have a responsive and balanced helm, even when reefed in a Force 6. She pointed exceedingly well with very little leeway. When under spinnaker she could be a bit frisky, and I experienced a broach, but she soon recovered. Alacrity 19 or Vivacity 20? It is difficult to spot differences between the Alacrity 19 and the Vivacity 20. 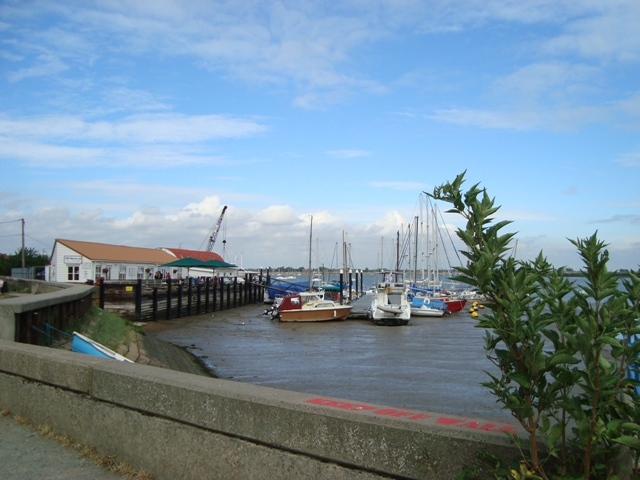 Both boats were built by the Essex based moulders, Hurley Marine. The LOA of the Vivacity was 20’ 2” and the Alacrity was 18’ 6”. The Alacrity came first and was stretched to become the Vivacity. 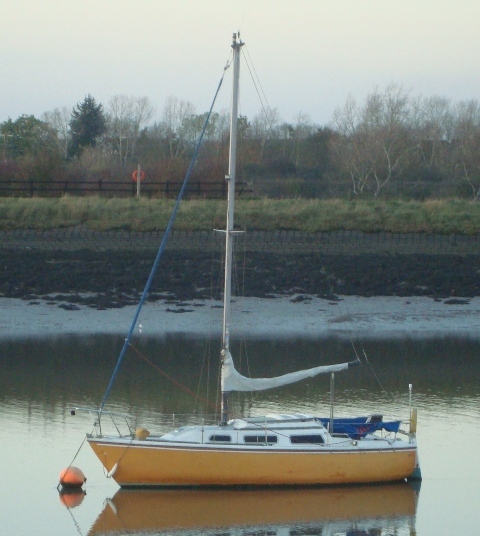 The smaller boat was designed by Peter Stephenson in 1960, but the Vivacity was designed by D. C. Pollard. There’s a lot of information on the Web about the Jaguar 25. Mostly, reviews of the yacht at the time when she was being manufactured spoke of her as being a good performer. Prospective owners of Jaguar 25s could choose from one of three keel configurations: fin, bilge or lifting keel. Originally they were manufactured in the USA by Catalina yachts. In the early 1970s Frank Butler designed and built a series of Catalina yachts of which the Catalina 25 was one. 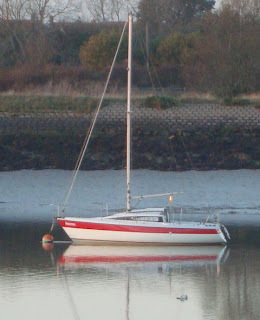 In the UK, Eric Birch at Canvey Island, Essex, started building a similar range of yachts under licence, and marketed them as Jaguar Yachts. Almost identical to the Catalina 25, Eric Birch’s Jaguar 25 quickly became a best seller. Altogether 940 were built before production ceased in the mid 1980s. 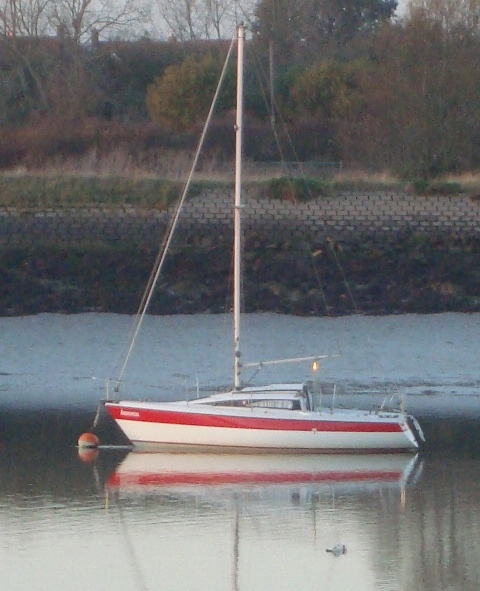 In 1982 Yachting and Boating Magazine test sailed the Mk 11 version. At that time 350 had been built. 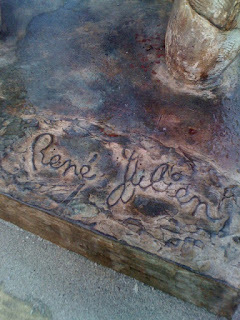 Popularity of the boat was due in part to her useful accommodation which had an ‘L’-shaped seat that fitted around a table. The table could be lowered to be level with the surrounding seats to form a smallish double bunk. Forward of the dinette there was an enclosed head on the port side; astern of the saloon there was the well-thought-out galley. 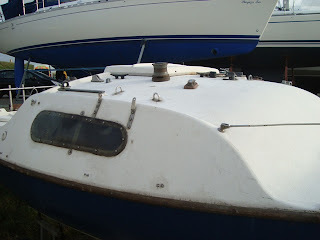 There was also a generous quarter berth on the port side, under the cockpit seat moulding. In the forward cabin there was a ‘V’- shaped double berth. Aft of that on the starboard side there was a hanging locker, and adjoining it in the saloon, there was a single settee berth. The cabin had standing headroom, and the beam of the boat was 8 feet, which gave plenty of space for the crew and their gear. She could be equipped with an outboard motor on a bracket, set to one side of the transom so as to be clear of an externally hung rudder, A few Jaguar 25s were fitted with 7.5 HP Volvo diesel Saildrives. 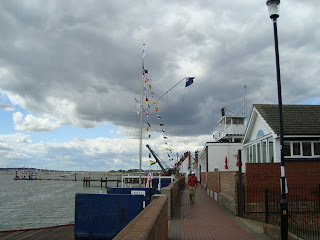 Handling was vice-free, except in very strong winds, when the yacht had a fair bit of weather helm. 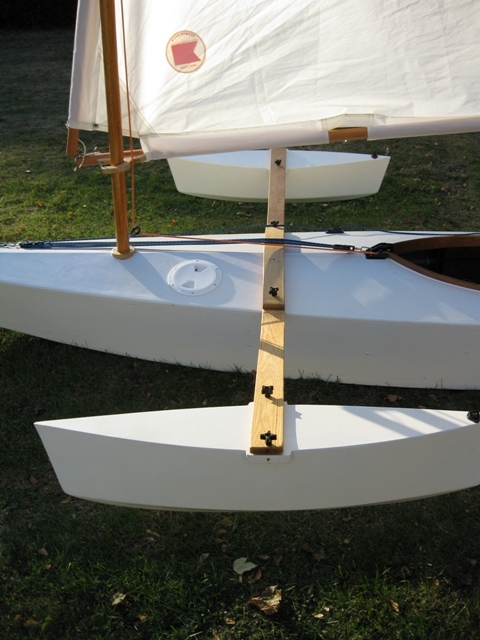 The Mk 11 model was closer-winded than her predecessor, because her shrouds were mounted inboard to enable a better sheeting angle for the foresails. The shrouds being inboard, gave better access to the foredeck. 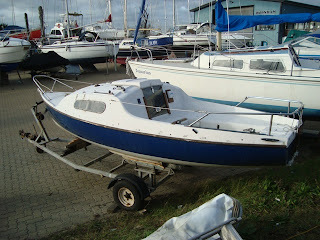 The 25’ Jaguar proved to be a good all-rounder, suitable for cruising or for club racing. A friendly football match between England and Spain at Wembley is scheduled for tomorrow, and FIFA was not at all happy that the English squad intended wearing poppies on their shirts as a mark of respect for those in the armed forces who had given their lives for their Country. At first they banned the English team from wearing them, but after the intervention of the Football Association, and requests from the Prime Minister and Prince William, FIFA agreed to let the English team wear poppies on black armbands. 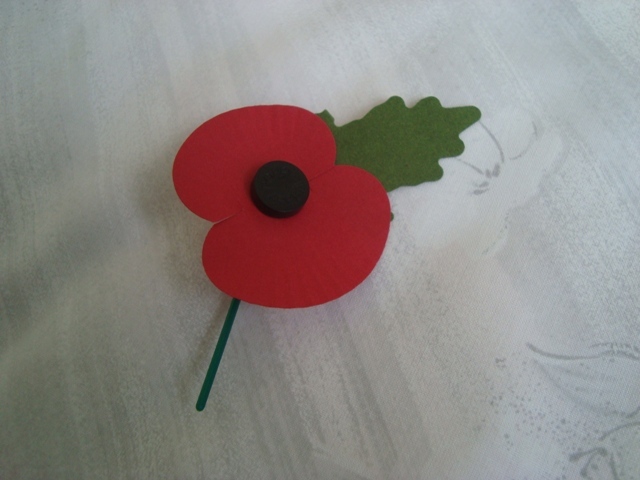 I can understand, and have some sympathy for FIFA, because they believed the wearing of poppies on player’s shirts would set a precedent. Indeed, that could well have been the case. A happy compromise has been reached. I hope the match between the two sides will indeed be friendly, and may the best side win. For the past three days the subject of my articles has been my Sony 7.2 Mega Pixels camera. Yesterday I spoke of photos taken with the camera and I illustrated my words with four photographs of creatures: tropical fish in a tank, a dragonfly perched on a bush, swans by the riverside and a Painted Lady butterfly. 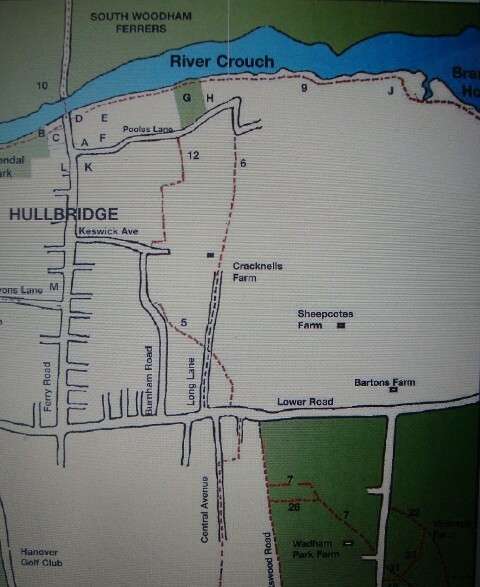 The subject of my final article is ‘Special Places’. The significance of places in the lives of individuals may only be appreciated by the people themselves, but there are places that have significance for many people. One such place is the Cenotaph, a war memorial in Whitehall, London, where those who were killed in the service of their Country are remembered annually on the 11th November. Each one of us may have special places we like to visit, and places we remember because of experiences associated with them. My roots are in the town where I was born, and the place I like to remember most is where I spent my youth. Therefore a very important place for me is the house where I lived with my parents until I left home at the age of twenty one. The area has changed because of building development, but the house itself remains as it was. There are other places of significance to me, such as South Fambridge, which is very special, mainly because I have frequently sailed the River Crouch along that stretch of water, and because my favourite walk is beside the river at that spot. *For me it’s a never ending fascinating location. The natural phenomena of light, colour, wind, sounds, moving water, clouds, birds, and insects - they forever change and bring me delight.